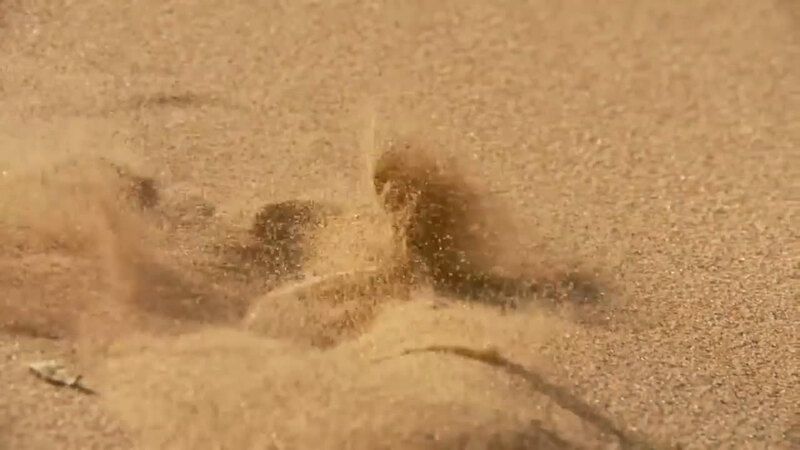 In the desert, the sand surface can become extremely hot during the day, up to 70ºC. 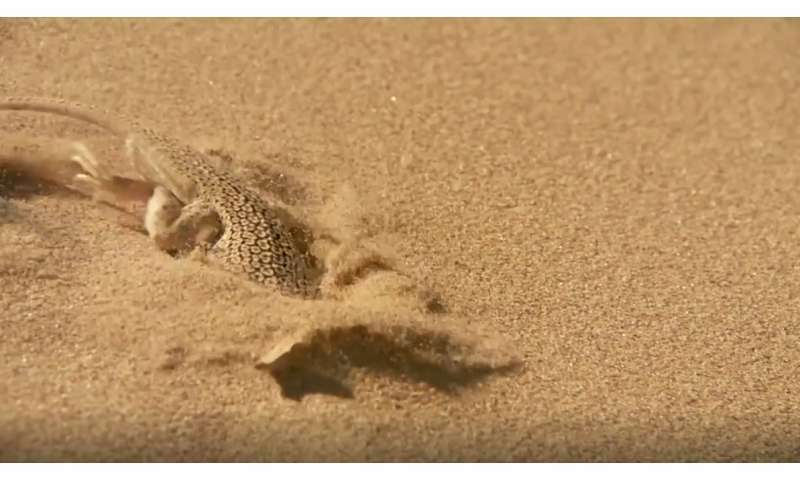 In order to escape these temperatures, some desert lizards adopt a fascinating strategy: They dive a few centimeters under the sand surface where it's much cooler (around 40º C). This is also a good strategy to hide and to escape from predators. But diving into the sand is a difficult task which requires a large force to overcome sand friction. In order to dive more easily, different genera of lizards like the fringe toed lizards and the horned lizards used rapid lateral undulations of their body in order to fluidize the sand. A team of researchers at the University of Santiago has inspected how these lateral undulations ease the penetration into granular media such as sand. They considered a model experiment of a solid finger penetrating different granular media made of small glass beads. Thanks to a tiny eccentric motor, similar to those used in cell phones and joysticks, they imposed mechanical vibrations of small amplitudes (about 10 µm) and low frequencies (100-200 Hz) to the penetrating finder. Results of these experiments are reported in PLOS One. Thanks to this setup, they showed that mechanical vibrations decrease the resistance to penetrate into a granular medium. "The resistive force can be decreased up to ten times by the presence of these tiny vibrations," explained Baptiste Darbois Texier, a post doc researcher of the SMAT-C laboratory where the study has been led. The researchers also sought the conditions under which a drop of the resistive force occurs. They proved that this phenomenon is controlled by the acceleration of the mechanical vibrations. When vibrations have an acceleration higher than gravitational acceleration, contacts between grains surrounding the intruding object are constantly broken. In order to observe the grains' motion, the researchers tracked the displacement of the grains in a two-dimensional version of their experiment. "We observed that when the vibrations have a sufficient acceleration, the grains in contact with the intruding finger start to follow a convective motion," said Alejandro Ibarra, a PhD student involved in the project. In such a convection zone, force chains that usually propagate into granular media are broken and the material is fluidized, an effect that finally reduces the force experienced by the intruding object. The lateral undulations developed by sand diving lizards like fringe toed lizards and horned lizards correspond to accelerations which are several times the gravitational acceleration. Thus, these undulations ensure the fluidization of the surrounding sand and the reduction of the resistive force to dive into it. The researchers think that such a strategy can be implemented to reduce the energy required by engines digging into soil. Looking after this purpose, the researchers conducted a complementary experiment. They added a small amount of water into the grains of their experiment in order to make them cohesive, the same cohesion that holds sandcastles at the beach. They were surprised to observe that the drop of the penetrating force still occurs in presence of cohesive forces. "The scenario of the resistance drop in presence of cohesive interactions by mechanical vibrations is still unclear for us, but it proves that the observed phenomenon is very robust and has to be considered for applications really soon," concluded Francisco Melo, the leading researcher of this study.